German rabbi; born in Gailingen, Baden, Dec. 1, 1843. He attended the gymnasium at Bischofsheim-on-the-Tauber, receiving at the same time instruction in the Talmud from his father, who was district rabbi there. He subsequently entered the University of Würzburg (1862), attending concurrently the Talmudic lectures of Rabbi Seligmann Bär Bamberger, and then went to the yeshibah of Rabbi Israel Hildesheimer at Eisenstadt, Hungary. In 1872 he became district rabbi in his native place, and exchanged that position in 1887 for his present one in Mosbach, Baden, where he officiates as rabbi for the three districts of Mosbach, Merchingen, and Wertheim. In 1891 he was decorated with the Zähringer Löwenorden. 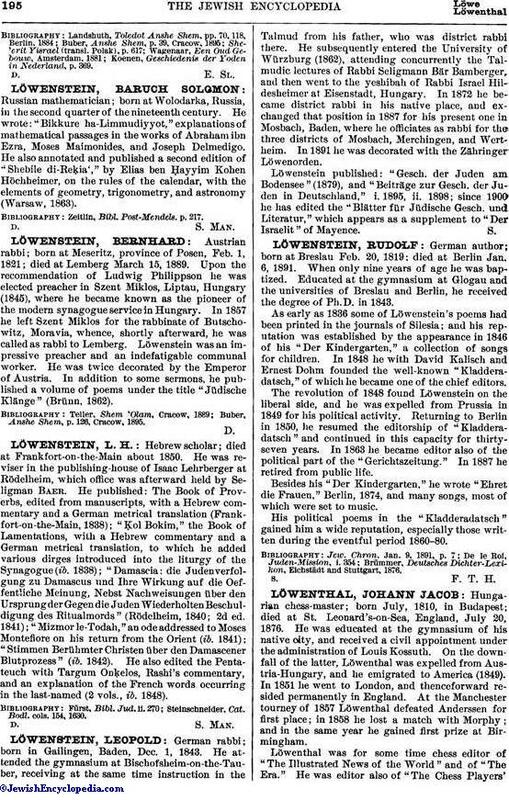 Löwenstein published: "Gesch. der Juden am Bodensee" (1879), and "Beiträge zur Gesch. der Juden in Deutschland," i. 1895, ii. 1898; since 1900 he has edited the "Blätter für Jüdische Gesch. und Literatur," which appears as a supplement to "Der Israelit" of Mayence.